Swansea City interim manager Alan Curtis says referee Graham Scott was "out of his depth" as he made several controversial decisions during the Swans' 4-2 loss to Sunderland. Swansea, who were awarded a dubious penalty but felt two of Sunderland's goals were offside, will appeal against Kyle Naughton's red card. Sunderland boss Sam Allardyce also thought Scott made several "mistakes". "I think he got all the major decisions completely wrong," Curtis said. "The big talking point is the referee's decisions. I'm disappointed. "We benefited from the penalty but you look at the other decisions. I don't want to criticise referees but I think he got the big ones wrong tonight. "I won't say it has cost us the game as you don't know how it will play out but it has had a major bearing on the game. Unfortunately he did look out of his depth." 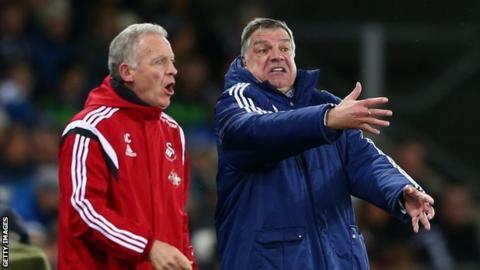 Allardyce added: "I think he made some mistakes. He made some errors for both sides. "We've come back to overcome the penalty decision and win the game. But obviously Swansea had some bad decisions for them as well." Taking charge of only his fourth Premier League game, Scott was appointed referee for this crucial match after the more experienced Andre Marriner withdrew because of illness. Sunderland's win moved them to within one point of safety, just one place below Swansea who are 17th in the Premier League table. Jermain Defoe's hat-trick was the catalyst for the Black Cats' second successive league victory, but he looked to be in an offside position for his first and second goals. And while Swansea were awarded a debatable penalty when Andre Ayew appeared to trip over his own feet, the game's turning point was Scott's seemingly harsh decision to send off Naughton for his stretched challenge on Yann M'Vila. "I thought he won the ball and you only have to look at the video and he has won it cleanly," said Curtis. Allardyce agreed, saying: "I thought it was a soft red card. "There was contact. I think he got the ball but I think the follow-through caught him. My interpretation is not the interpretation any more. "For me it's get up and get on with it, give him a foul." Swansea have won only one of their seven games under Curtis, who succeeded Garry Monk on 9 December and was handed the reins until the end of the season earlier this month. The Swans' next match is at home against Watford on Monday, 18 January.